Join us as along with over 20 artisans for our NEW Holiday POP-Up Craft Market POP-UP this year at all the Wednesday Market Suppers in December. We are so excited to be able to bring you so many additional handmade for the holiday features to choose from for gifts and your holiday homefront. 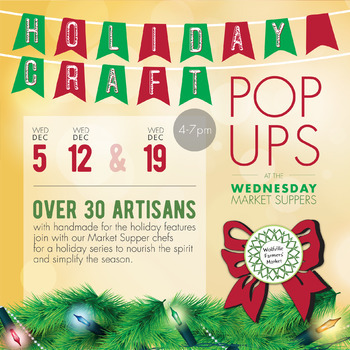 We’ll make the holiday prep-season easy and enjoyable with our Market Suppers, live music, and a chance for kids to be able to make decorations, all in a lovely atmosphere with lights, greenery and seasonal colours. We will even have a special Solstice Supper on December 19th.